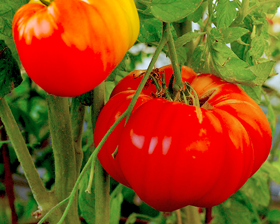 Big, juicy, delicious tomatoes - ideal sliced in sandwiches and salads. Rich red, very ribbed fruits can grow over 900g each in weight if the trusses are trimmed to 3 or 4 fruits per truss. Each plant produce about 30kg of tasty fruits. Height 2-2,5m. Sow seeds late winter till the end of spring 6mm deep in pots or trays of good, free draining, damp seed compost and cover with a sprinkling of vermiculite or compost. Place in a propagator, or seal container in a polythene bag, at 18 - 21C until germination, which takes 7 - 10 days.